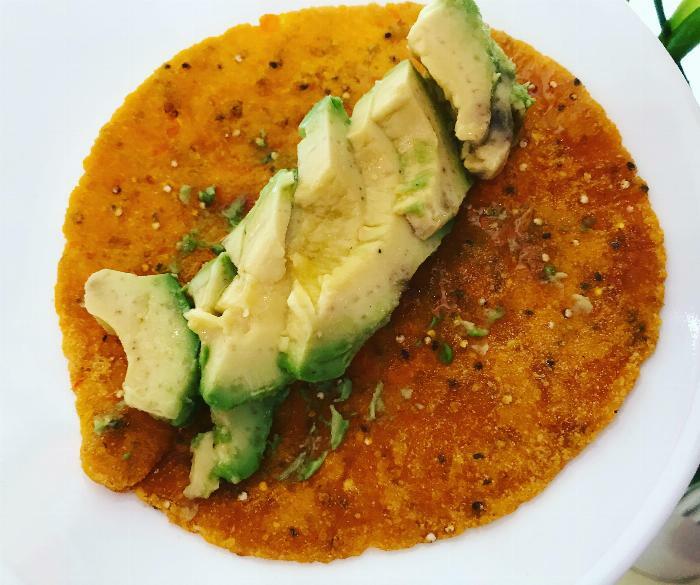 Soft Paleo Sweet Potato Tortillas that don't taste like cardboard and have an incredibly soft texture. After years of trying Paleo and GF tortillas that taste like cardboard, break apart and are impossible to eat as a suggested tortilla, I finally came up with the perfect solution. 1 fine mesh strainer, not a colander. 1Pre heat oven to 380 degrees. Wash and cut sweet potatoes. Make sure that you keep the skin on so that you are able to consume the entirety of a soft sweet potato without a hardened skin on the outside. Oil them lightly with your favorite paleo approved oil. You can use your own type of oil for your dietary needs. I use avocado oil. They will take about an hour if cut into thirds. This depends on the size of your sweet potatoes. 2While they are cooking gather your other ingredients. I don't mix my ingredients together first. One of the secrets to paleo breads, cakes and cookies is to have dry ingredients, where the fats and the oils of the seeds or nuts aren't interfering with the "flour" feel of the flours. Make your flaxseed egg. I use flaxseed because it helps with the textural integrity. Set aside. Measure your yucca flour , Maca, chia, quinoa, and tapioca starch and set aside. 3Once cooled, peel and mash the sweet potatoes. Do not add any extra fats. These types of "doughs" are definitely delicate and require lots of attention to detail. 4Directly to the sweet potato, add the flax seed egg and mix well. Use a colander to sprinkle in the rest of the flours, start with the Yucca flour, sift it through a fine metal strainer, then mix into the sweet potato mixture. Next, sift in the tapioca starch, then the Maca, Once everything is nicely incorporated, I add in the chia and quinoa. These give it a nice crunch that mimics the grainier "corn" texture without adding too much. The dough will feel wetter than any pasta or tortilla dough you have used before. It will "tighten" once you refrigerate for 30 minutes. This dough works better at a colder temperature. I do not make the balls all at once. I make 2-3 at a time and refrigerate the dough in between their griddle time. 5Using a cast iron griddle, heat to medium high. I used 6 on my dial . Do not add grease or oil yet. Use a tortilla maker, to flatten your tortilla between 2 sheets of plastic wrap or parchment paper. Parchment paper works well. Flatten, but do not add pressure to the tortilla maker. If you are rolling out using a rolling pin, barely apply pressure, the width will vary. Make sure they are no bigger than 1/4" thick or they will barely cook through. Place tortilla onto the griddle and leave alone for several minutes. It will take a few minutes to cook through and you will see "spots" of cooked dough vs. raw dough which is darker, wetter looking. I take a brush and brush around the tortilla with avocado oil. Flip the tortilla and try to take in some of the avocado oil. This is all the oil you need. If you have a seasoned griddle, you may skip this step if nothing sticks to it. 6Cook through and keep in a warm oven while the others are cooking. Flaxseed eggs feel more binding to me and less wet. Do not add any extra fats. These types of "doughs" are definitely delicate and require lots of attention to detail. Don't be afraid to experiment, it may require more or less of the Yucca flour or tapioca starch depending on your kitchen climate.